Captain Morgan knifes Admiral Nelson in the front. 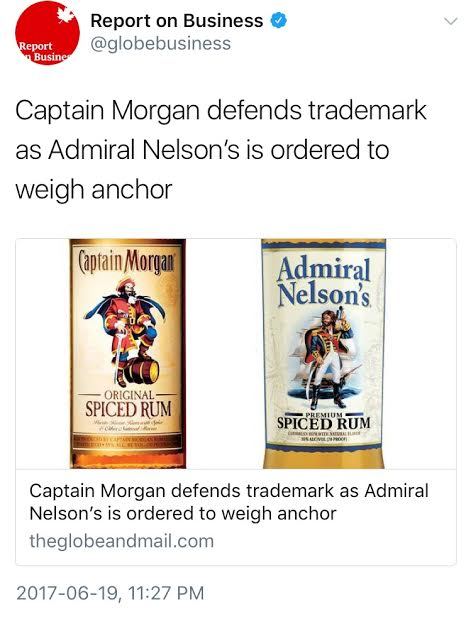 Diageo, makers of the rum best recognized for its pirate mascot, successfully argued in federal court that its character was infringed by rival distillery Heaven Hill—which failed to defend the look of its Admiral Nelson on the basis of being a historical figure. Captain Morgan’s company pointed out the admiral is depicted as blatantly younger than its 17th century inspiration, Horatio Lord Nelson, who was older with grey hair and missing an arm. 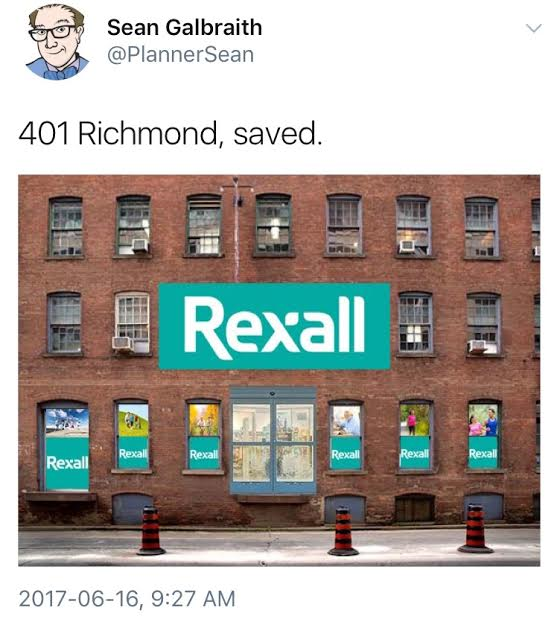 Spadina now belongs to Rexall. The northeast corner of Spadina and Dundas, built in 1922 as the Standard Theatre (and later the site of the Victory Burlesque) before settling into being most recognized as a Royal Bank, is the next location for the drugstore chain—adding to the one a few blocks north at College, not to mention the nearby conversion of Ye Olde Brunswick House. 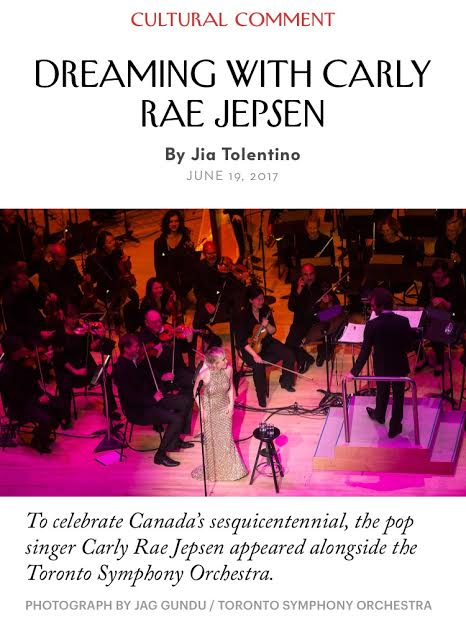 Perhaps the notion of Rexall moving into the endangered arts complex slightly to the south isn’t so far-fetched. Seven-year itch for a nine-minute reality show. 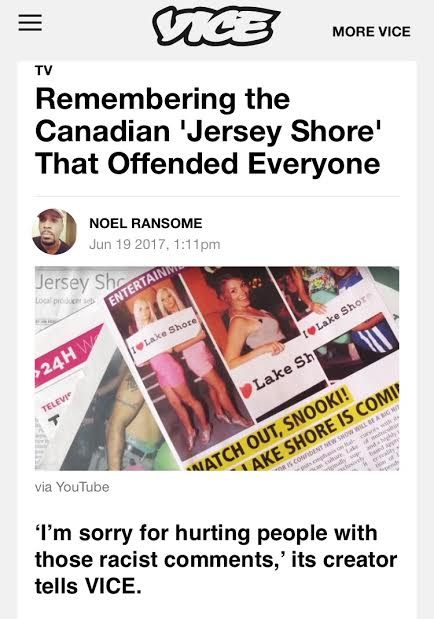 A local version of the then-popular Jersey Shore got closer to reality in 2010 when a casting call generated sufficiently ridiculous club kid stereotypes. Maryam Rahimi, who posted the original casting call on Craigslist, had her innocent notion turned into a montage of verbal conflict between would-be cast members by producer George Tsioutsioulas—creating a firestorm in the halcyon days of social media outrage. Chances are, few would’ve remembered Lake Shore's trainwreck this well had episodes actually been produced. NXNE honcho Michael Hollett’s description of his music festival—while bragging about how it secured sponsorship from Porsche.